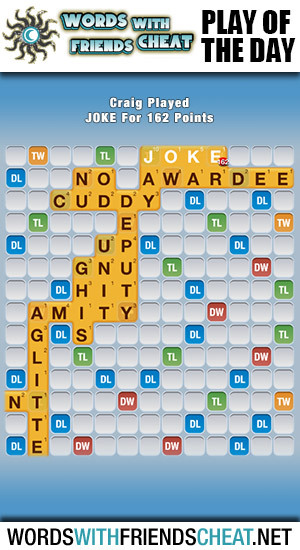 Today’s Words With Friends – Play Of The Day is JOKE (162pts) and was submitted by Words With Friends Cheat user Craig. How do you go about scoring 162 points using four letters. Well, theoretically it’s actually rather simple. All you need to do is position your play over a triple word and a triple letter. Then you also need to attach it to not one but FOUR other words. In theory, simple; in practice, not so simple. This is why Craig is being featured as today’s Play Of The Day. verb (used w/out object), joked, joking. verb (used w object), joked, joking. 7. to subject to jokes; make fun of; tease.